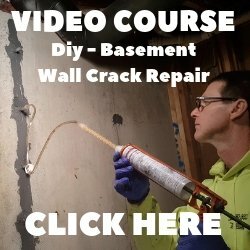 Poured In Place Concrete Countertops - What are some of the Advantages? Poured in place concrete countertops, also called cast in place concrete countertops, are built, poured, and finished right on top of the cabinets at the jobsite or in your kitchen. 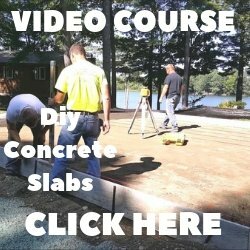 This technique of building concrete countertops has some advantages over a precast concrete countertop that is built in a shop and installed after it is completed. One of the main advantages of casting a concrete countertop in place is, you don't have to lift, deliver and install the concrete countertop. Concrete is very heavy, at 2 inches thick it weighs 25 pounds a square foot. A concrete counter measuring 8 feet by 2 feet will weigh 400 pounds. Not having to move this heavy concrete countertop from the shop, into a truck, then back out of the truck, through the door and onto the cabinets when you arrive at the jobsite, is a big advantage. Another advantage of pouring a concrete countertop in place is forming odd angles or curves. It is much easier to match the contour of a curved or angled wall when you form right on top of the cabinets. No Seams - casting a concrete countertop in place allows you to pour the entire countertop without any seams. A seamless concrete countertop is virtually impossible on larger kitchens. A Perfect Fit - some walls and cabinets will not be perfectly square and plumb. 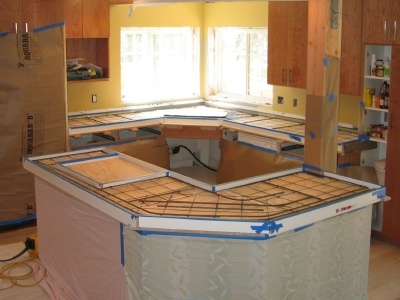 Even if you make a template there is always a chance the countertop will not fit perfectly. By casting the concrete countertop in place, you will have a perfect fit every time. If you're not sure a poured in place concrete countertop is the best method for you, check out the advantages of a precast concrete countertop.